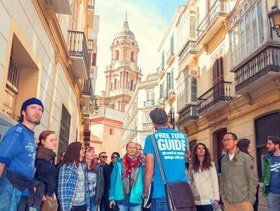 Book this tour for free and the guide will be waiting for you to have fun learning about the history of Malaga! "Nuestro tour con María por el casco histórico de Málaga ha sido un gran descubrimiento. María ha sido muy simpática y nos ha contado muchas anécdotas..."
Walking Tour with a Local Tour Guide in English/Spanish during 2 hours 15 minutes. 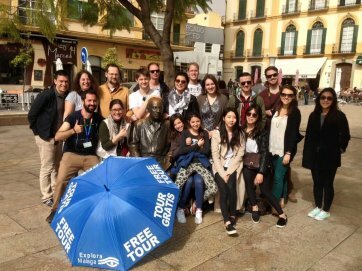 Come and learn about the most important events in Malaga´s history with this walking tour. Full of legends, funny facts and tales. The birth of the city with the arrival of the Phoenicians, the Carthaginians passing through during Punic Wars, the remains and culture left to us by the Romans and Visigoths, the interesting Arabic castles with their ingenious defense systems and the conversion made by the Christians after the Reconquest. 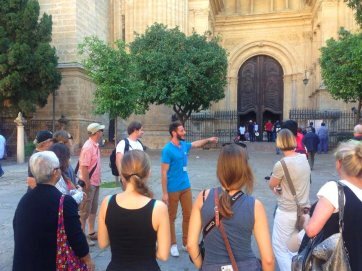 Explore with the group this wonderful Free Tour in Malaga, where you will learn walking through the city centre, where are located the most important monuments as the Málaga Cathedral, the Roman Theatre, the Muslim Castle: La Alcazaba and a lot more! Our guides are locals that love the city of Malaga, and they will show you in a funny and entertaining way, the history of our city just like we have been doing for a lot of visitors. What does it mean that the tour is free or Free Tour? Free Tour means that you can decide the price of the tour in the end of it. It is not only because is more fair that customers decide the price of the Free Tour according to how much they liked it. It gives us motivation to work hard and do our best everyday! Guided tour inside of the Monuments. Free cancellation until 0 day(s) before starting time. "Nuestro tour con María por el casco histórico de Málaga ha sido un gran descubrimiento. María ha sido muy simpática y nos ha contado muchas anécdotas interesantes." "We had a great time, your team and organisation were excellent." "Picked up a lot of useful knowledge"
"La visita ha estado muy bien. El guia nos ha explcado todo muy bien, ha respondido nuestras preguntas y ha sido amable y divertido. " "Our guide was Maria - very nice, polite, friendly, funny and helpful! We are very happy with the tour and the tips she gave us! " "A very enjoyable and informative two and a half hours . Ten out of ten for Alex for his enthusiastic explanation of Malaga "
"It was great tour. Javier is the best guide ever ;o) He showed us around and had lots of funny and interesting things to say. A very nice way to get to know the Center of Málaga and its places and sights of interest. He also answered a lot of questions at the end of the tour. I had a great time!" "Lucia "España". Un viaje estupendo, un guia maravilloso. Totalmente recomendable. We'll come back!! :-)"
"A great introductory tour of Malaga from both a history and cultural perspective. Amanda is full of energy and very animated!" "Loved Luis he was funny but also very interesting. Would highly recommend this tour. " "Magnífico guía, magnífico tour. Dos horas y media divertidas y llenas de contenido histórico. Juan Manuel hace su trabajo inmejorablemente. ¡Nos encantó el tour lo mismo que la ciudad! ¡Gracias Juan Manuel!!!" "The tour was great. I really loved it. Our guide was very enthusiastic and shared a lot of information about Málaga with the group. He also shared a lot of tips related to eating, drinking and sightseeing. I would recommend this tour to everyone who's visiting Málaga." "A great tour of Malaga - very professional and informative but also friendly and a lot of fun." "Very informative and fun, my friends and I really enjoyed the walk"